October 17, 2012 – The first stage of operation ‘New Website Look’ is complete! HUGE credit and thanks from all of us needs to go to Jason ‘WhiteBread’ Costner ofwww.HipToBe.com who has hand sketched all the artwork and brought it to life. Watch as the colours swirl through the jukebox! 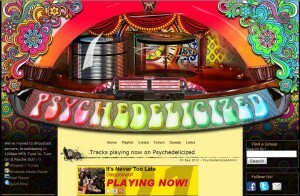 =-) As time permits, there will be further enhancements, with expanded artwork and animations, but for now, just bask in the wonderful glow of the Psychedelicized Jukebox! More great work by Mr Costner!